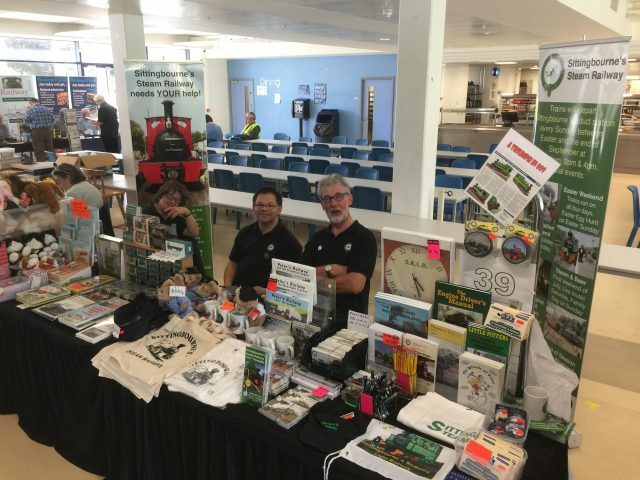 The Railway’s Away Sales Team represent the Railway at various events around the country. Upcoming events are listed below, if the text is coloured click on it to be taken to the relevant webpage for the event (external to our website). 23rd-24th February 2018 – Tenterden Model Railway Exhibition, 10am-5pm Sat. & 10am-4pm Sun. at Homewood School, Ashford Road, Tenterden, Kent, TN39 6LT. Organised by the North Kent Model Railway Group. Admission: £5 for adults, £4.50 for concessions, £3.50 for children and £12.50 for families. All profits are donated to the sixth form’s ‘World Challenge’ project which sees the students travel to an African country for a month to do community work. 2nd March – Heritage Fair, 10am-3pm at The Alexander Centre, 15-17 Preston Street, Faversham, Kent, ME13 8NZ. Admission free. Come along to see the best of what East Kent has to offer. There will be stalls about local groups, societies, attractions and places of interest. 24th March – The Holiday & Leisure Show, 10am-4pm at a new venue: The Kent Event Centre, Kent Showground, Detling, ME14 3JF (between Sittingbourne and Maidstone on the A249). Admission and parking is free. This is a great show for finding out about the many tourist attractions in Kent. Many of the stands have exclusive offers for visitors and we will be giving away 100 goody bags! If you would like to invite the Railway to an event, please email info@sklr.net, we have a sales stand which sells books, toys and gifts to raise money for the Railway. We do have a small marquee and a gazebo for outdoor events. Margaret, Iain and Barry await your custom!